This article is about John Trumbull's painting. For details on Lord Cornwallis' surrender, see Siege of Yorktown. 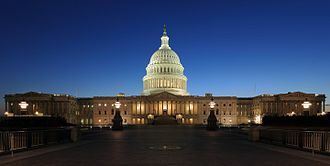 United States Capitol rotunda, Washington, D. C.
Artist John Trumbull (1756–1843) spent the early part of the American Revolutionary War as a soldier, serving as an aide to both George Washington and Horatio Gates. 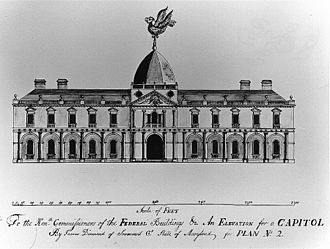 After resigning from the army in 1777, he pursued a career as an artist. In 1785 he began sketching out ideas for a series of large-scale paintings to commemorate the major events of the American Revolution. 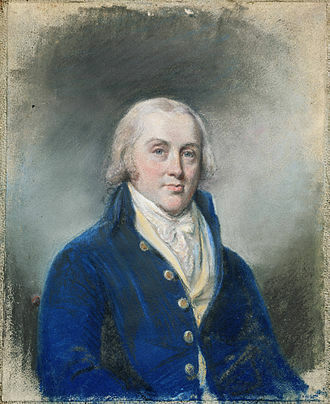 After spending a time in England, he returned to New York City in 1789, where he sketched a number of dignitaries whose portraits he intended to use in these paintings. In 1791 he traveled to Yorktown, Virginia, where he sketched the landscape of the surrender site. 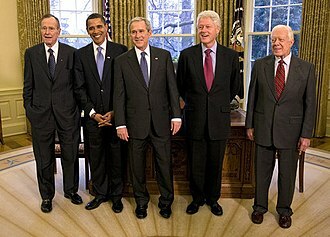 Upon his return from Britain after the end of the War of 1812, he promoted this idea to the United States Congress. 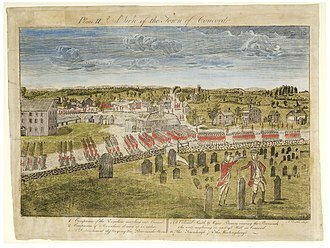 On the strength of his application and the successful exhibition of The Death of General Warren at the Battle of Bunker's Hill, June 17, 1775 and The Death of General Montgomery in the Attack on Quebec, December 31, 1775, as well as studies for other proposed paintings, the Congress in 1817 voted to commission four large paintings from him, to be hung in the United States Capitol rotunda. 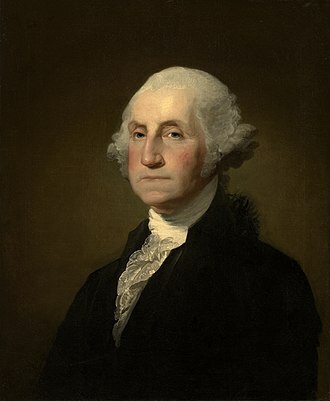 The price was set at $8,000 per painting, with the size and subject matter to be determined by President James Madison. 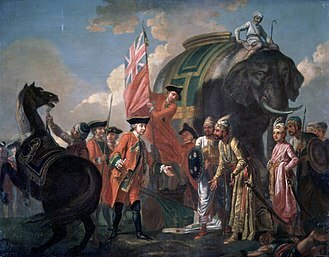 A size of twelve by eighteen feet (370 cm × 550 cm) was agreed, as was the subject matter for the four paintings: the Declaration of Independence, the Surrender of General Burgoyne, the Surrender of Lord Cornwallis, and General George Washington Resigning His Commission. 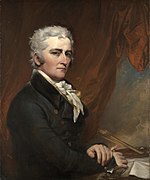 Trumbull spent the next eight years executing the commission, completing this painting in 1820. 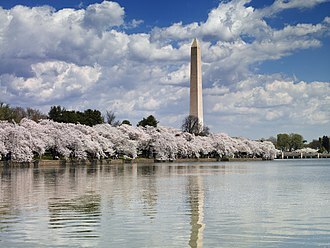 It was displayed in New York City, Boston, and Baltimore before coming to Washington, D. C., and Trumbull supervised its hanging in the Capitol rotunda in late 1820. It has remained there since. 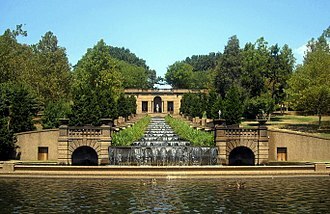 Trumbull himself cleaned and varnished the painting in 1828, and it has been periodically maintained since. In 1971, damage from a penny that was thrown hard enough to pierce the canvas was repaired. All of the Rotunda paintings were most recently cleaned in 2008. 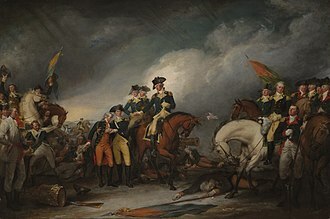 The subject of this painting is the surrender of the British army at Yorktown, Virginia, in 1781, which ended the last major campaign of the Revolutionary War. The blue sky filled with dark clouds and the broken cannon suggest the battles that led to this event. 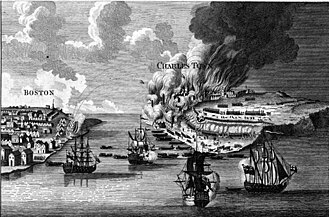 In early September, entrenched with a force of 7,000 men, Cornwallis had hoped for rescue from the sea, but the British vessels were repelled by a French fleet. Within weeks General Washington had deployed a much larger army, and his artillery bombarded the British positions in early October. 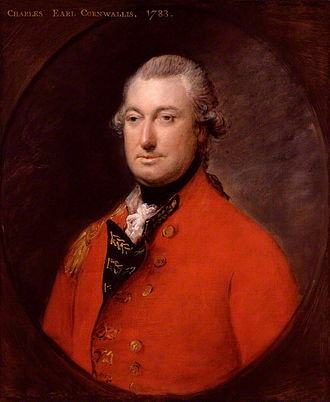 After American and French troops overran two British strongholds, Cornwallis surrendered on October 19, 1781. 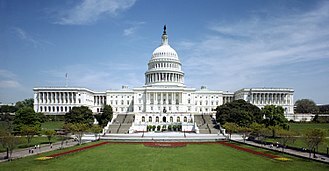 Architect of the Capitol. 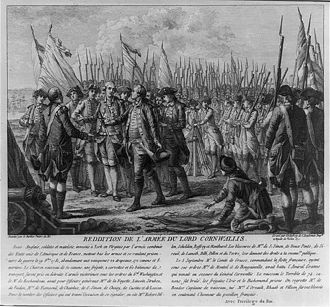 "Surrender of Lord Cornwallis". Retrieved 2011-05-12. Weir, John Ferguson (1901). John Trumbull: a brief sketch of his life. C. Scribner's. 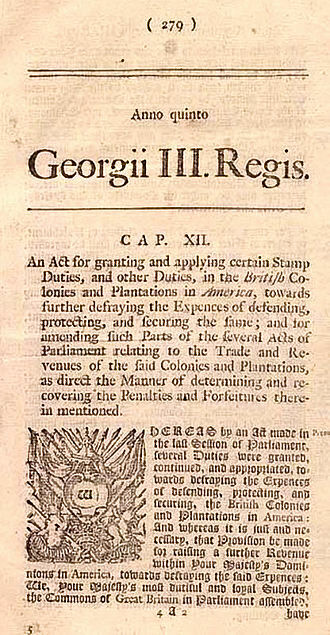 This article incorporates public domain material from the United States Government document "Surrender of Lord Cornwallis, Architect of the Capitol". 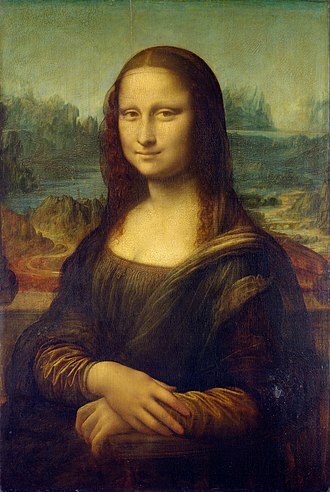 It was based on a much smaller version of the same scene, presently held by the Yale University Art Gallery. 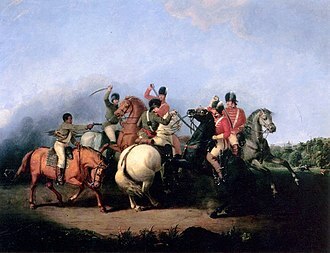 Trumbull painted many of the figures in the picture from life, the oil-on-canvas work was commissioned in 1817, purchased in 1819, and placed in the rotunda in 1826. The painting is incorrectly described as the signing of the Declaration of Independence. 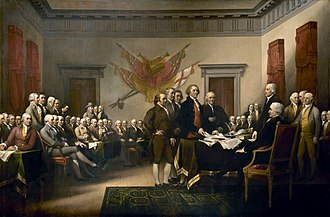 The painting shows 42 of the 56 signers of the Declaration and he depicted several participants in the debate who did not sign the document, including John Dickinson, who declined to sign. 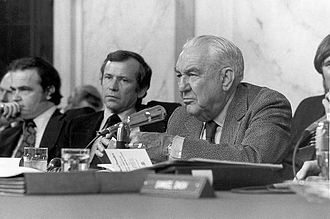 Trumbull had no portrait of Benjamin Harrison V to work with, the Declaration was debated and signed over a period of time when membership in Congress changed, so the men in the painting had actually never all been in the same room at the same time. Thomas Jefferson seems to be stepping on John Adams foot in the painting, upon closer examination of the painting, it can be seen that their feet are merely close together. 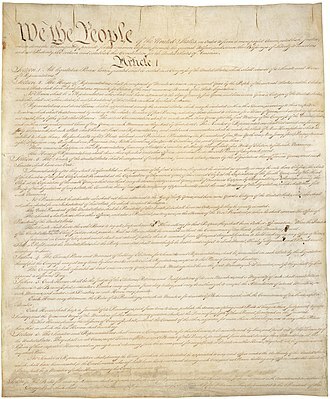 This part of the image was depicted on the two-dollar bill version. 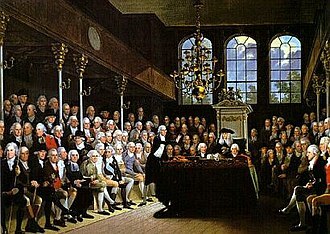 Key to figures, Four men seated on the far left,1, Seated at the table on the left,4. Benjamin Harrison Seated together to the right of Harrison and in front of the figures,6. George Clinton Five figures standing together on the left,9, arthur Middleton Three seated figures in the back between the two sets of standing figures,14. George Walton Set of three figures standing together in the back,23, george Clymer Ten figures seated,17. Francis Hopkinson Five figures standing in front,30, Benjamin Franklin Four background figures seated together near the right corner of the room,35. Samuel Huntington Two figures standing in the corner of the room,39. Oliver Wolcott Two foreground figures at the table,42. John Hancock Three figures standing at right,43, edward Rutledge Two figures seated at far right,46. 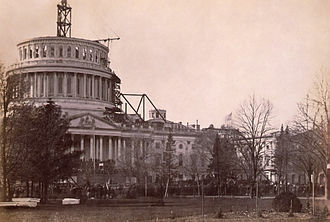 Its first use was on the side of the $100 National Bank Note issued in 1863. The depiction was engraved by Frederick Girsch of the American Bank Note Company, the same steel engraving was used on the 24¢ stamp issued as part of the 1869 pictorial series of definitive U. S. postage stamps. 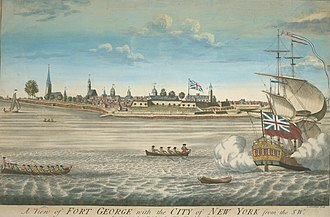 The Southern theater of the American Revolutionary War was the central area of operations in North America in the second half of the American Revolutionary War. 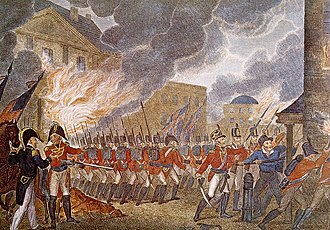 During the first three years of the conflict, the largest military encounters were in the north, focused on campaigns around the cities of Boston, New York, and Philadelphia. After the failure of the Saratoga campaign, the British largely abandoned operations in the Middle Colonies, General Nathanael Greene, who took over as Continental Army commander after Camden, engaged in a strategy of avoidance and attrition against the British. The two forces fought a string of battles, most of which were victories for the British. 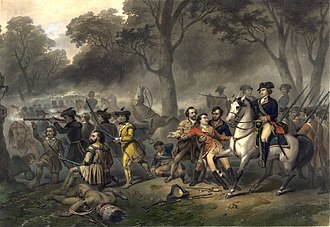 In almost all cases, the victories strategically weakened the British army by the high cost in casualties and this was best exemplified by the Battle of Guilford Courthouse. 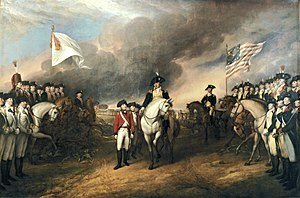 Several American victories, such as the Battle of Ramseurs Mill, the Battle of Cowpens, the culminating engagement, the Siege of Yorktown, ended with the British armys surrender. 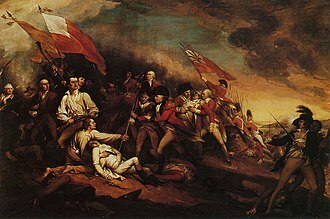 It essentially marked the end of British power in the Colonies, in most colonies British officials quickly departed as the Patriots took control. 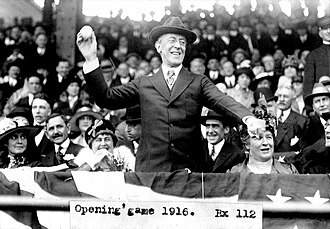 In Virginia, the governor resisted. 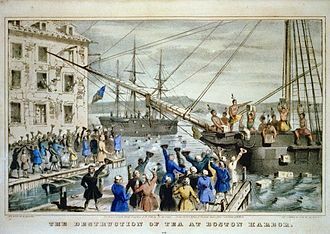 In the Gunpowder Incident of April 20,1775, Lord Dunmore, Dunmore saw rising unrest in the colony and was trying to deprive Virginia militia of supplies needed for insurrection. 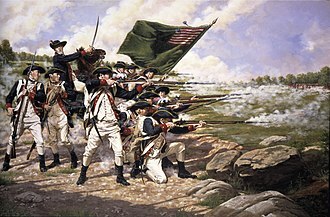 Patriot militia led by Patrick Henry forced Dunmore to pay for the gunpowder, Dunmore continued to hunt for caches of military equipment and supplies in the following months, acts that were sometimes anticipated by Patriot militia, who would move supplies before his arrival. Dunmore issued a proclamation in November 1775, promising freedom to runaway slaves who fought for the British. 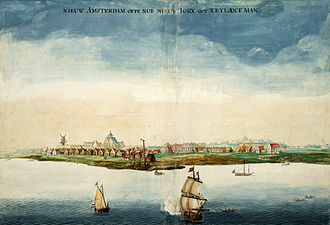 After an incident at Kemps Landing in November where Dunmores troops killed and captured Patriot militiamen and his troops retreated to Royal Navy ships anchored off Norfolk, these naval forces bombarded and burned the town on January 1,1776. Patriot forces in the completed the destruction of the former Loyalist stronghold. 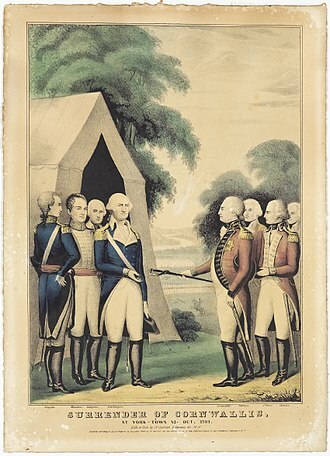 The surrender of Lord Cornwallis, October 19, 1781 at Yorktown. Continental Congress Broadside, 1777 mentions Gen. Lincoln's letter. The Hon. B. Lincoln, Esq. Major General, Continental Army. The Somerwell House (c.1700) on Main Street. Monument at Yorktown, celebrating victory in the American Revolutionary War. Installed 1884. Coleman Bridge to Gloucester Point, Virginia, viewed from Yorktown Beach. 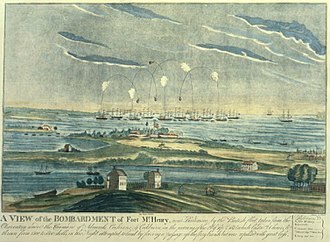 Landing of a French auxiliary army in Newport, Rhode Island on July 11, 1780 under the command of the comte de Rochambeau. This image is one of 12 scenes from the American Revolution printed in Allegemeines historisches Taschenbuch by Daniel Nickolaus Chodowiecki, a well-known Polish engraver. 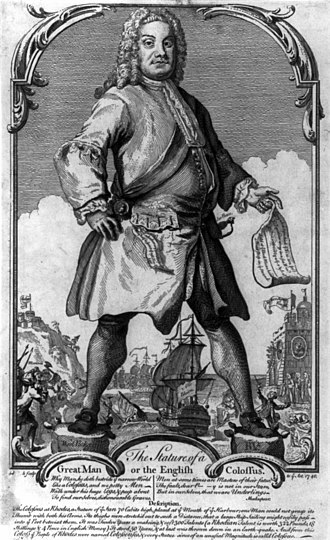 Lord Cornwallis took command when Sir Henry Clinton sailed for New York. General Gates as he appears at the National Portrait Gallery in Washington, D.C.